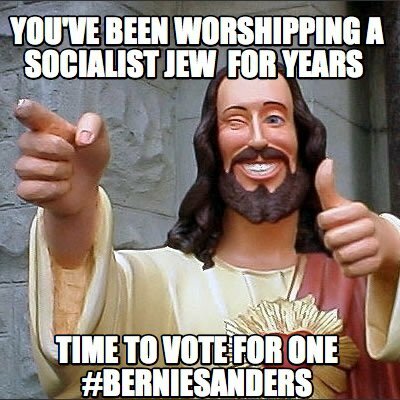 One of the category mistakes American Christians often make is expecting the government, in any way whatsoever, to look, act, or be anything even remotely close to ‘Christian.’ There’s a popular meme in support of Bernie Sanders that has been floating around that nicely illustrates this. It is ostensibly attempting to galvanize Christian support for Sanders based on the claim that Sanders (somehow) resembles Christ. (I like Sanders the best among the available options, but Jesus he is not.) For whatever reason, we tend to want our government to in some way approximate our God: among Christians on the right, this has amounted to imagining the U.S. as a “Christian nation,” whereas Christian lefties have wanted a Jesus-shaped socialism. Both hopes are totally misguided. There are biblical and theological reasons why such hopes are woefully misplaced, but we can leave them aside for now. The most potent reason why it is foolish to hope for a Christian or Christ-like America is: the nation and its ruling powers do not want to be Christian. Today, May 1, 2016, marks the five-year anniversary of the killing of Osama Bin Laden (alternative spelling in Tweet). To commemorate it, the CIA’s social media person is “live-tweeting” the narrative of Bin Laden’s death as if it were taking place again today. Although met with disgust in some quarters, the performance appears to be trading well on the currency of nationalism and revenge—two values at odds with nearly every aspect of the Christian confession. Even if we concede that Osama Bin Laden’s death was justified—which, if one believes that God at times makes use of the nations to perform God’s justice and achieve God’s ends, is not that difficult (even for a Christian pacifist)—there is still something deeply and profoundly un-Christian, even anti-Christian, about performing a ritual that celebrates the killing of the enemy. In a Christian frame, even among Just War theorists, intentional homicide never represents a moral good. It never represents the best of what could have been. At best, it is always less than the good that could have been. (Even Christians willing to kill for particular reasons should be able to recognize this. One can make a case that killing may at times be justifiable, but it is never representative of the good that could or should have been.) No committed Christian can say that the best possible world is the one in which Bin Laden was killed. For the Christian, the best possible world is the one in which Bin Laden had become a brother in Christ. His death is not worthy of celebration among Christians; it is grounds only for lament. His story, inclusive of all the horrors that he wrought, is a tragedy; his death simply cannot be taken by Christians as reason for celebration. Yet the CIA celebrates Bin Laden’s death with the support and co-commemoration of many of their followers. In this way the CIA’s social media performance is an aping of the Christian ritual of communion. Whereas Christians follow the example of Paul and “proclaim the Lord’s death until he comes” (1 Cor 11:26), the CIA is proclaiming the death of the enemy, presumably with no eschatological end in sight. But it is built on the same logic: we re-enact, relive, and in some way embody the celebrated story through its ritual retelling. One group tells the story of the man whose death put an end to the hostility between and among humans, while the other tells the story of a death that only reflected, if not built-up, the dividing walls of hostility that already divide humanity. The CIA is doing us all a favor by showing, in no uncertain terms, how vast the differences are between the Kingdom of God and the rule of the nations. For those with ears to hear and eyes to see, the CIA is trying to tell us: the government has no use for the Christian story. The government has no use for Christ because the government does not want to be Christian. I didn’t react to the “Buddy Christ” meme as an attempt to garner Christian support, as much as a spotlight on the inappropriate politicization of Jesus. For one thing, Bernie’s an ethnic Jew, not observant. Some Christians try to squash Jesus into a partisan preference box, though we have Gospel evidence he dismissed all political solutions as inadequate. His teachings are above the level of politics and government, addressing the spiritual root of every problem. The CIA ritual is stupid and insensitive, but people do celebrate days of victory, even when the victory consists of killing and defeating other humans through violence. I appreciate your mentioning Jesus’s politics. I don’t think his teachings were “above” politics and governments, but I do think that his gospel (the Kingdom of God) is of a different *kind* of politics and government — namely, God’s politics and God’s government. And, yes, of course people celebrate things like this. That’s why I wrote the post.